1. Make the sauce. In a large (10-inch) skillet over medium heat, melt the butter. Add the nuts and stir until toasty smelling, about 4 minutes. Stir in the honey, tequila, black pepper and a good sprinkling of salt. As soon as the honey begins to simmer, reduce the heat to low and keep warm. 2. Grill the plantains. Heat a gas grill to medium-low or light a charcoal fire and let it burn until the charcoal is covered with white ash and only less than medium hot. (This is a good recipe to do when the fire is burning down after you've grilled your main dish.) Make a slit down the side of each plantain through the skin, but not into the flesh. Lay the plantains on the grill and cook, turning regularly, until the plantains are completely soft (the skin will char a bit), 15 to 20 minutes. Peel back the skin from each piece and slice the plantains 1/2 inch thick. 3. Finish the dish. Warm the banana leaves on the grill until shiny. 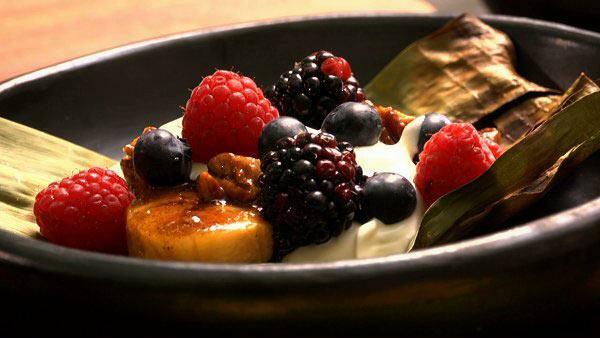 Divide leaves among dessert plates and top with a portion of the plantains. Spoon on a portion of the nut mixture, then some cream and berries, and you're ready to serve.